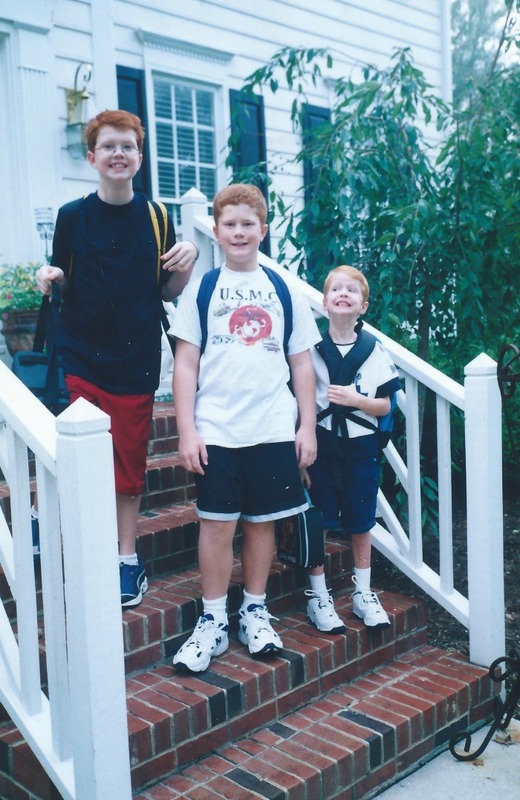 The first day of school was all about making sure his lunch was packed and that he had the right kind of safety scissors and taking his picture with his big brothers. And then after loading up the minivan, the first day was all about the drive to school with an excited kindergartner and his 4th and 6th grade brothers. It was all about letting the big boys go into school from the car pool line, but Mom will park and walk in with him. The first day was all about Mom's telling him that everything would be okay, that he'd have fun and learn lots of wonderful things. But that first was 12 years ago. What? Wasn't it just a little while ago? I swear it couldn't have been more than five years ago. But now the first day is about making sure he has all the forms filled out and his tie is properly tied and a last-minute I-don't-have-time-for-a-picture-where-are-my-keys? And Mom doesn't even drive to school at all, let alone with a van full of boys. The first first day was about Mom's comforting the boy. Now, on the last first day, who comforts the mom? Oh they do grow up so fast. Hold on, new firsts are just beginning. It will be okay, Richella. It will be more than okay. Today is sad, but tomorrow? Filled with hope and promise. Such a joy to watch these babies grow into fine young men. (Now, if we could do that without all the complications of aging ourselves!) Beautifully told. Thinking of you today as you transition to the next season of life. We work so hard to prepare our kids for independence but it sure it tough emotionally when they become so independent! Oooooh, you poor mama. I'd give you my hand to hold if I were just a bit closer. And you can hold mine next year when I have my own "last first." This is so sweet. Today has to be bittersweet for you. I wish I were closer, we'd go for a walk and have a good talk. Endings are new beginnings. Change can be hard and letting go even harder, but there really is a good life called the empty nest. Beautifully written and I'm so grateful to you for sharing this posting. Today was our "baby's" last first day, too. She overslept, much rushing around, hugs and kisses were given but the photo was forgotten! Thank you for sharing with all of us. Oooh! I am going through the same thing! My youngest drove away yesterday morning for his first day at a new University while I watched with the biggest lump in my throat. They grow up so fast! Yes, Richella. the time really does fly! It seems we were just dropping our girls off for their freshman years; and now, we have a junior and a senior! I am just amazed at the wonderful young women that they have become! I well remember my baby's (now 41) first day of pre-school. I watched as other little children were crying & clinging to their moms, but Michael walked right in to the room. I kept standing there waiting, and finally the teacher gave me a hug and sent me on my way. That very confident little boy is now an extremely confident chef, husband & father. I wish that pre-school teacher could see him today! 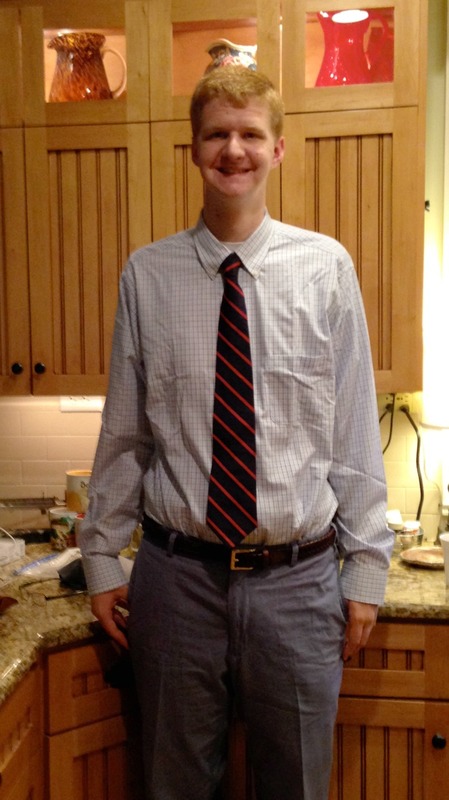 Your son looks very confident, too; but I just have to ask where he goes to school wearing a tie? I think that is wonderful -- this old Momma hates the way kids dress today and truly believe all school children should wear uniforms. I'm thinking this could be fodder for another post!